LA Dodgers Defeat Milwaukee Brewers To Reach World Series Los Angeles held off Milwaukee 5-1 in Game 7 of the National League Championship Series. The Dodgers will go to the World Series for the second year in a row, this time facing the Boston Red Sox. 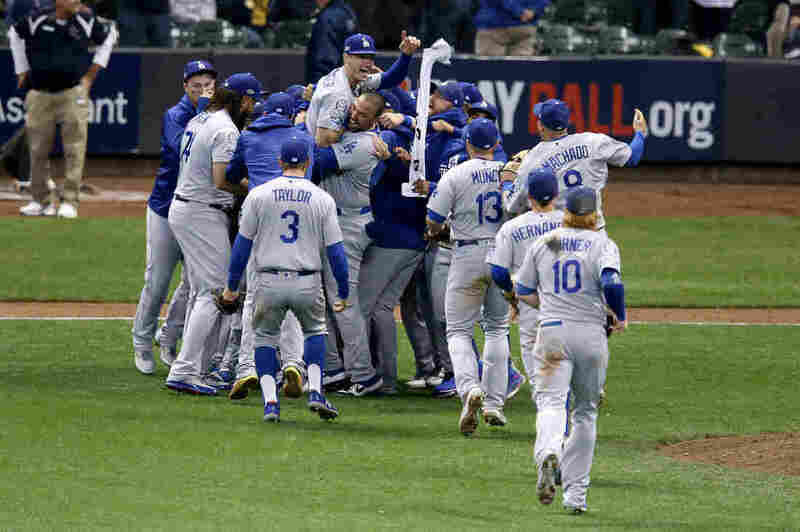 The Los Angeles Dodgers celebrate after defeating the Milwaukee Brewers in Game 7 to win the National League Championship Series at Miller Park on Saturday, in Milwaukee. With the win, the Dodgers will return to the World Series for the second year in a row, to face off against the Boston Red Sox — and look to rewrite last year's fate, after losing Game 7 of the World Series to the Houston Astros. It was a tight game until the sixth inning, when Yasiel Puig's three-run homer handed the Dodgers a promising cushion. By the ninth inning, star pitcher Clayton Kershaw stepped in as relief pitcher to finish off the Brewers with the final three outs. The Brewers, meanwhile, were betting against Dodgers rookie pitcher Walker Buehler, who's struggled as a two-time starter this playoffs. The 24-year-old let in six hits, including Milwaukee's Christian Yelich's first-inning home run. "Yelich looked like he would hurt the Dodgers again in the fifth with Lorenzo Cain on second with two outs. The NL MVP candidate hit a high, hard liner to left that seemed destined to fall in for a double. "Running at full speed to his left, Taylor extended his glove high in the air just as the ball settled into the mitt to end the inning." In the second inning, a two-run homer from Cody Bellinger lifted the Dodgers to 2-1. "They made the plays, they made the pitches when they had to (make) to win," Yelich said, the AP reports. The last time Los Angeles won the World Series was in 1988. "It's pretty cool. It's going to be a pretty special series," newly crowned NLCS MVP Bellinger said, according to the AP. "I know how lucky I am to be a part of it two years in a row." The Red Sox — who beat the Houston Astros to win the American League Championship Series on Friday — will host the Dodgers in Game 1 of the World Series on Tuesday night at Boston's Fenway Park.